How does Reply Guard work? 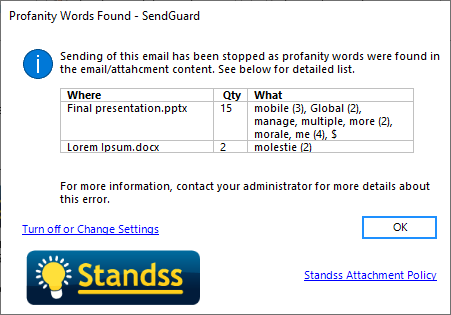 SendGuard can scan email contents (body and subject) for specific words or data patterns. We have now added new functionality for SendGuard to scan inside attachments for the same (or different) words or data patterns. SendGuard then warns the user or blocks the sending of the emails. Note: Attachment scanning is available for an additional fee. Please contact us at sales@standss.com for a demo or a quote. 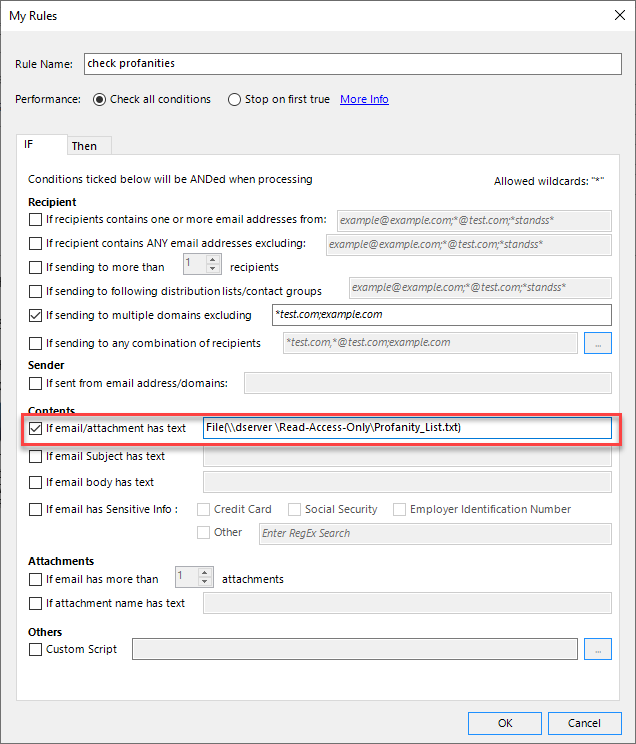 This feature is currently integrated into Send Rules. We are also integrating it into other components of SendGuard. Please let us know if you have any specific requirements. Our support and development team are available to ensure that our software fully meets all your requirements. If you are not already familiar with Send Rules, follow the instructions here to learn how to create a rule. If you have purchased (or are trialing) the Attachment Scanning, you will now see an additional option for If email/attachments has text as shown below. Fill in the box with the words you want to check in the email content separate by semi colon (;) OR use a text file to keep all your list of words in one text file where more words can be added without changing the rule itself. Words in the text file can be kept in one line separated by semi-colon (;) or can be kept one word per line which is easily manageable. Once this is done, do the other necessary steps to finish saving a rule. The next time you send an email with attachments, it will be scanned using your new rule. The following is an example of a prompt displayed if the rule is setup to block emails with profanities being sent out. For more information, contact sales@standss.com.